Rookie Cards: Ted Kazanski, Thornton Kipper, Tom Qualters, Stan Jok, Mickey Micelotta, & Paul Penson. Additional Information: The first 50 cards of the set are available on both white-backed cardboard stock and gray-backed cardboard stock. The cards printed on gray stock were printed and distributed in Canada, are available in smaller quantities, and accordingly carry a modest premium in price. As was the case with the 1953 Topps set, the relatively small size of the set, as well as the notable absence of many of the Phillies stars of the time, resulted entirely from Topps’s ongoing legal battles with Bowman, who had secured exclusive baseball card contracts with many Major League players. This also explains why the set features two Phillies coaches, their manager and a slew of rookies. 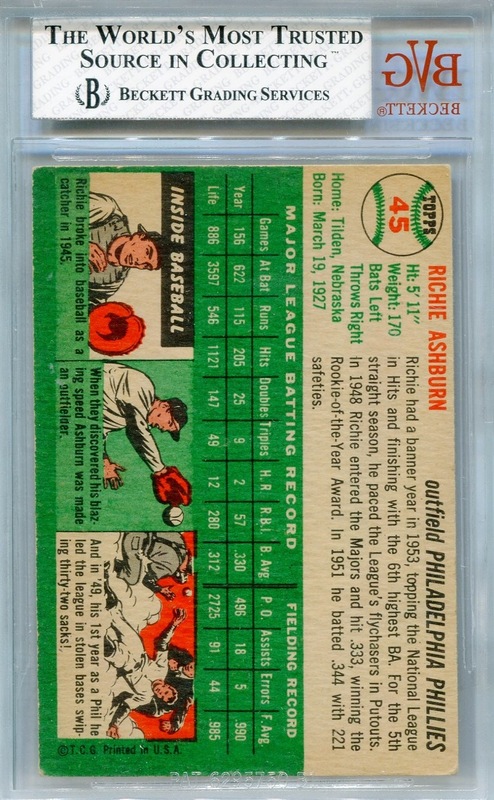 In 1988, Topps, in conjunction with Campbell’s Soup, issued a 10” x 14” sheet commemorating Richie Ashburn’s 40 years in Major League Baseball. 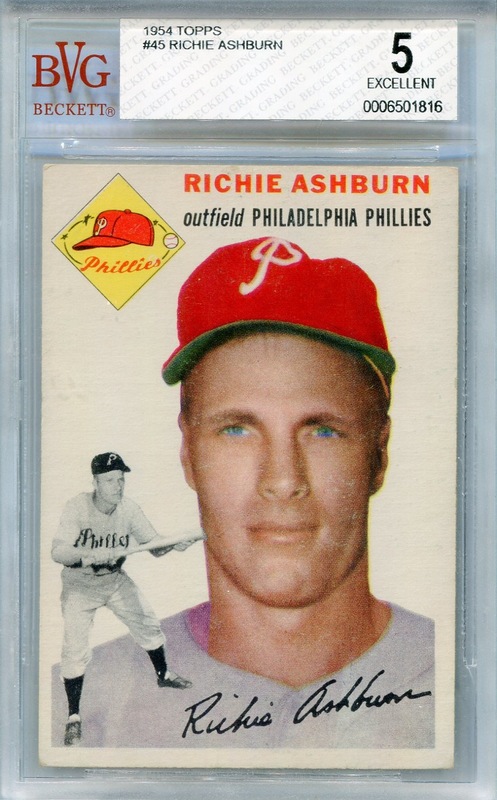 This perforated sheet contained reprints of numerous cards through Ashburn’s playing career, and his 1954 Topps card was among those reprinted. Set was later reprinted in its entirety in the 1994 Topps Archives 1954 set. 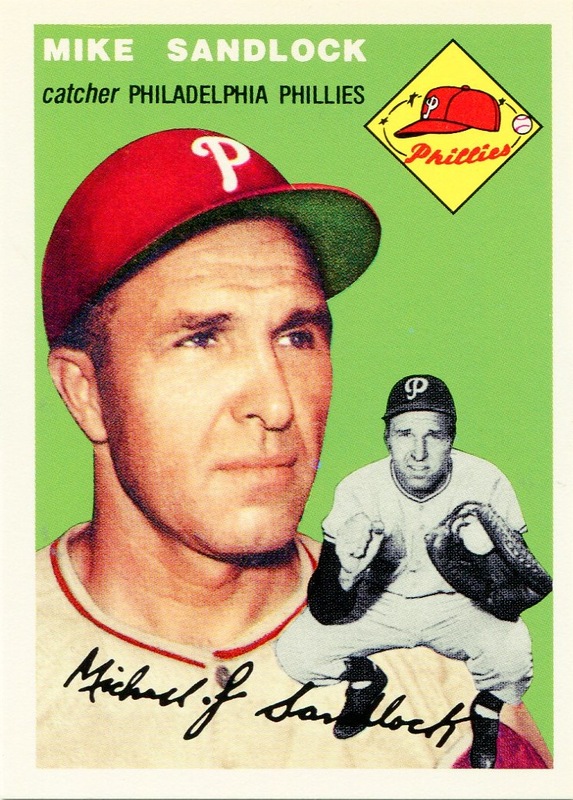 Topps has also recycled the 1954 design on numerous occasions; most notably, in the 2003 Topps Heritage offering, which actually contains more Phillies (20, not counting variations) than the 1954 set. Mayo, Micelotta, Penson and Sandlock all signed reprints of their cards as part of the 2003 Topps Heritage Real Ones Autographs insert set. Topps first reused the design in the 2000 Topps Gallery Heritage insert set, but no Phillies appeared in that offering. That same year, Fleer borrowed heavily from the 1954 design in its Fleer Tradition set. The 2007 Topps Wal-Mart insert set contains a Chase Utley card, the front of which was “based on the 1954 Topps design.” Finally, Topps reused the design for Carlos Ruiz’s and Cole Hamel’s cards in the 2012 Topps Archives set. 14,000 Phillies Commentary: Once you’ve counted the rookies, manager and coaches, you realize that there are only five Phillies in the set who were established Major Leaguers: Hamner, Ashburn, Jones, Lindell and Sandlock. However, Sandlock never actually appeared in a game as a Phillie; his appearance in the set is entirely the result of his being signed during the ’53-’54 off-season to be Lindell’s personal catcher. Lindell was primarily a knuckleballer, and Sandlock caught for him in Pittsburgh the year before. Thus, the Phillies thought there might be some value in having a catcher on staff with experience in handling the pitch. According to an article in the March 6, 1954 issue of The Milwaukee Journal, the Phillies thought he might receive plenty of work given that other pitchers on the staff also experimented with the pitch. However, 1953 was the first time Sandlock played in the majors since 1946, and his numbers in Pittsburgh were rather ugly. It’s no surprise that he ultimately didn’t work out. The numbers Sandlock posted for San Diego in the Pacific Coast League in 1954 show that Phillies were right in releasing him. As part of an ongoing series examining Topps cards throughout the years, the Phillies Room contains an informative write-up on the set.